In summer when you are having a BBQ in the back yard with friends and family, enjoying the sun, having a laugh and enjoying a cold drink, nothing could be further from your mind than where the ice in the esky has come from. Here at Macrack, we actually know where it comes from, because it is stored in our racking system, our drive in racking system to be precise. Installed in the early 2000’s Brisbane Ice works warehouse, based in Newstead, has been producing bags of ice for Queenslanders year round. When the Christmas festive period rolls around there is a huge spike in demand for ice, as we are all going from one event to another, filling our esky’s, serving the cold cooked prawns on a bed of ice, trying to keep the left-over food cool because the fridge is so full. In preparation for this Brisbane Ice works year round to produce enough ice for the masses, and as soon as that season is over they start preparing for the next events, such as Easter, Cricket, Australia day etc. Drive in racking is a LIFO Storage system. Where the First pallet to go in (on any particular level), is the last to come out. You can however, pick from different levels at different pallet depths without being restricted. For instance, the top level might be fully loaded with pallets, yet you can still drive into the bottom level and reach the back pallet. It’s a very economical solution. As you can imagine, ‘Brisbane Ice Works’ Warehouse is pretty cold year round. This can have adverse impacts on machinery and fixtures, if not thought about correctly. Steel expands and shrinks with the ambient air temperature, therefore when you come from the tropical climate of Brisbane into a warehouse that sits below zero, you must factor in the shrinkage of steel. To combat this Macrack has engineered their system to be able to withstand both heat and cold, allowing for movement within the system whilst still being incredible strong. 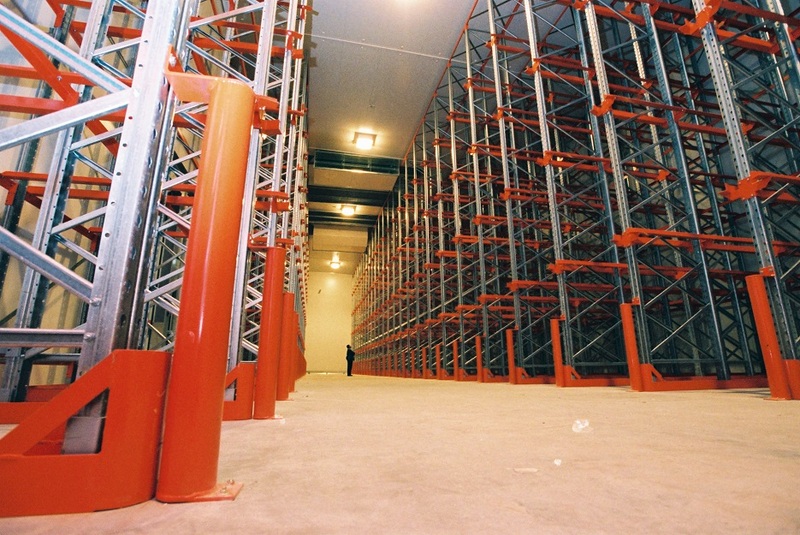 It can be stored in a bulk situation and the best way to do this is through Drive in pallet racking. This way you can store maximum amounts of goods, and utilise almost all the volume of the warehouse. Don’t forget that when thinking about warehouse storage you need to consider volume. That’s width, length AND height, whilst minimising your aisle ways. The industry standard for pallets is around 1000kg each, although not every company has the pleasure of being standard. Ice works has pallets weighing in at 1500kg each, to address this Macrack increased the capability of the frames what we used, increasing the capability to be extra heavy duty. We increased the width of the frame profile to maximise the potential storage capacity, allowing the pallet to be stored with confidence. When it’s your company and your livelihood, you want to have the confidence that your racking system will be able to withstand the workload you give it. That’s why Brisbane ice works choose Macrack and their Drive in Racking system, because it can and does preform to a higher standard compared to other companies, and it is a truly reliable brand.